The container carriers APL Denver and Wan Hai 301 collided off Pasir Gudang Port in Johor, Malaysia. The Singapore-flagged ship Wan Hai 301 was en route from Port Klang to Pasir Gudang, proceeding through the separation scheme with heavy traffic, but her route was crossed by boxship APL Denver. The both duty officers neglected situation and reacted too late, failing to prevent collision. Following the accident, the container ship APL Denver suffered breaches and damages of bunkering tanks after being hit in the board by the bow of Wan Hai 301. At least 300 tons of oil spilled into the water off Pasir Gudang Port. The accident was immediately reported to the local authorities, as well as Maritime and Port Authority of Singapore. At the scene were dispatched rescue boats and twelve anti-pollution craft. The water cleansing operations were started immediately, but winds and currents spread the oil spot to Pulau Ubin. The hazmat teams are working to contain the spilled oil and to restrict the environmental pollution. The both vessels were detained during the further investigation for the responsibilities during the collision. The container carrier APL Denver suffered breaches and some controlled water ingress, but without danger for seaworthiness. The counterpart, Wan Hai 301, was slightly damages in the bow without water ingress and underwater breaches. None of the seamen on board were injured. According to preliminary information, the collision was caused by failure of the diesel generator on Wan Hai 301 carrier. “Traffic in the East Johor Straits and Singapore’s port operations remains unaffected. The spill had been contained off the western side of Singapore’s Pulau Ubin island”, said the official statement of Maritime and Port Authority of Singapore. The container carrier Wan Hai 301 (IMO: 9238155) has overall length of 199.90 m, moulded beam of 32.20 m and maximum draft of 11.00 m. The deadweight of the ship is 30,250 DWT and the gross tonnage is 26,681 GRT. The carrier was built in 2001 by Naikai Shipbuilding Seteda Factory in Japan. The owner and manager of Wan Hai 301 is Singaporean logistics operator Wan Hai Lines. 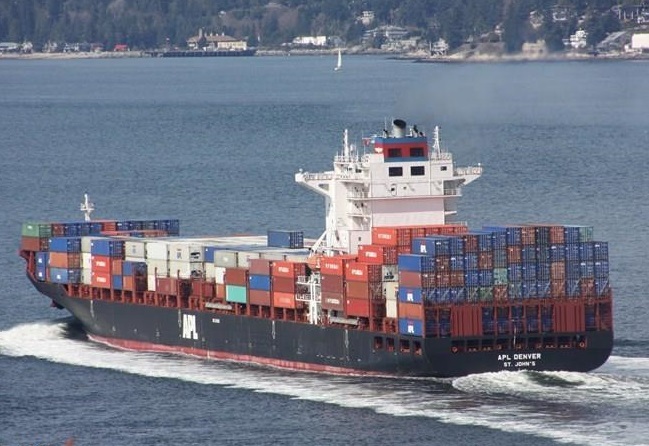 The container ship APL Denver (IMO: 9345960) has overall length of 267.15 m, moulded beam of 32.30 m and maximum draft of 12.00 m. The deadweight of the vessel is 55,612 DWT and the gross tonnage is 43,071 GRT. The container ship was built in 2008 by New Century Shipbuiulding in their shipyard in Jingjiang, China. The owner of the APL Denver is German company Hanseatic Lloyd Schiffahrt, while operator if APL Logistics.